The following article was written by Peter E. Hamilton, and first published in the Dictionary of Hong Kong Biography, edited by May Holdsworth and Christopher Munn. The publisher, HK University Press, has kindly granted permission for it to be posted here, but retains copyright over this material from 2012. Forbes, Robert Bennet b. 18 September 1804, Jamaica Plain, Boston, USA; d. 23 November 1889, Boston. Trader. Forbes, John Murray b. 23 February 1813, Bordeaux, France; d. 12 October 1898, Boston. Trader and railroad developer. “The China trade in the 19th century was the foundation of wealth of several New England families, who in turn helped to finance industrialisation in the USA, particularly the development of railroads to the American West. At the centre of this elite network of families were three brothers: Thomas Tunno, Robert Bennet and John Murray Forbes. Their mother was the younger sister of Thomas Handasyd Perkins, a leading public figure in Boston and the founder, with his brother, of the firm J. and T.H. Perkins of Boston and Canton. In 1830 the firm was merged with Russell & company, a commission agency founded by Samuel Russell in Canton in 1824 to trade opium, woollen and cotton cloth and other commodities in exchange for silk, porcelain and tea. The Forbes brothers led Russell & Co. – in its heyday the most powerful American merchant house on the China coast – from 1830 to its dissolution in 1891. 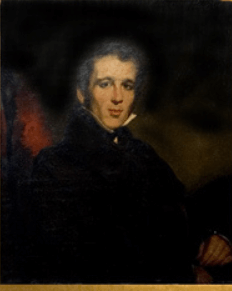 The eldest of the brothers, Thomas Tunno Forbes (1802-29), was sent to Canton in 1827, but drowned during a typhoon off Macau in 1829. The second brother, Robert Bennet Forbes, sailed to China as a 13 year-old cabin boy on his uncle Handasyd Perkins’ ship, the Canton Packet, in 1817. 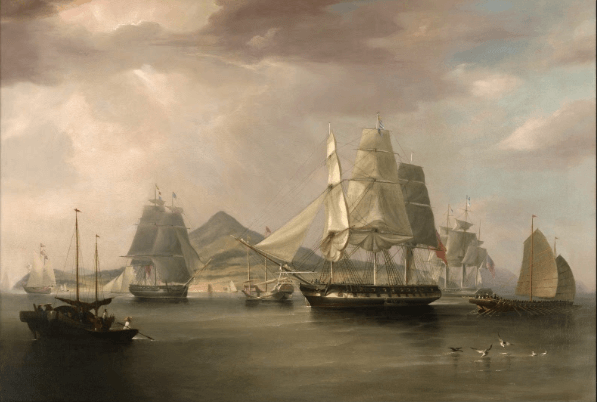 A master mariner, and later the inventor of the Forbes rig for sailing ships, he commanded his own vessel in a three-year voyage around the world in 1824-27. In 1830 he became the head of Russell & Co.’s opium storehouse, the Lintin, which was permanently anchored at Lintin (Lingding) Island, the opium depot in the Pearl River estuary. He handled the gritty tasks of repacking the Turkish opium for delivery and negotiating with smugglers and drug brokers. In the process he earned over $30,000 a year and went home a rich man. He married Rose Green Smith in 1834; they had three children. In June 1838, forced by imprudent investments and the Panic of 1837, he purchased a new partnership in Russell & Co. and returned to China. ‘Perhaps, Pro on a ship commanded by his brother Robertvidence took away my fortune because I made it in Opium – What I make this time will be free from that stain,’ he observed in a letter. Russell & Co. gave up the opium trade in February 1839, only a month before Imperial Commissioner Lin Zexu arrived in Canton with instructions to end it. The third brother, John Murray Forbes, sailed to China in July 1830 with Augustine Heard on a ship commanded by his brother Robert. 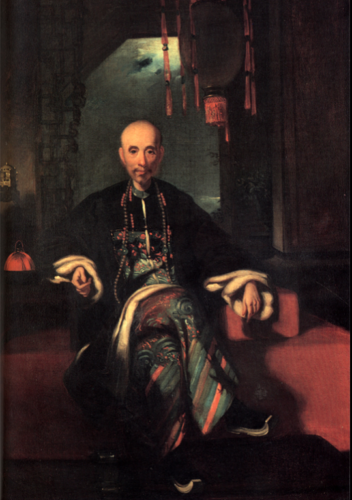 He quickly made a fortune in Canton, working closely with the rich hong merchant Wu Bingjian (1769-1843), known to Western traders as Howqua, and this connection greatly benefited the firm. Not only did Howqua provide ready loans to Russell & Co. to use as operating capital, but he and his family were later also to appoint the company to manage their investments in the USA, including the financing of railroads. 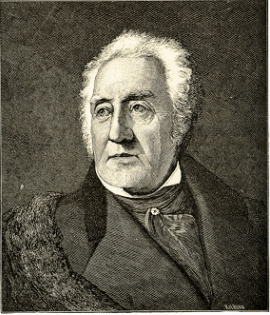 On furlough in Boston in 1834, John Murray Forbes married Sarah Hathaway of New Bedford, Connecticut. He left Canton in 1836, and went on to invest his Chinese fortune in the building of railroads across America. Howqua, painting by George Chinnery 1830. Russell & Co. managed to thrive without opium. 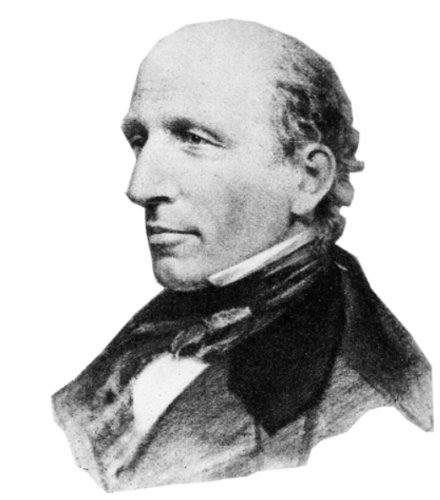 Robert Bennet Forbes rose to become the head of the firm in 1839, earned a second fortune, and returned to the US in 1840. But in 1849 his ‘spirit of adventure and bu for hsiness affairs’ led him back to China for a further two years. There is a story of Robert Bennet falling ill in Hong Kong and asking for his coffin to be made from the mast of his old ship the Lintin, which had been sold to the Chinese and had subsequently sunk in the Pearl River. He did not succumb to fever but went on to take part in several more adventures, including an expedition to South America bin 1858 and a journey to California in the first Pullman train to cross North America on the Transcontinental Railroad in 1870. His memoir Personal Reminiscences (1882) is an invaluable first hand account of the period. By 1850 Russell & Co, had been established on an even grander scale in Hong Kong, on Queen’s Road, its management strengthened by additional partners: George Tyson (see Chan Kai-Ming) and, in the 1860s, Warren Delano Jr. It diversified from commission trade, setting up the Hongkong Rope Manufacturing Company, and in partnership with Heard’s, tendering for a rice contract, a risky venture from which it later withdrew. The company’s commercial focus also shifted, the result of an economic slump in the US during the Civil War (1861-65), the replacement of clippers by steamships, and new fields of operation – notably coastal and river shipping – offered by the opening of more treaty ports in 1860. Russell & Co. had already carved out a steamer route between Hong Kong and Canton, pioneered the running of steamships on the Yangtze, although John Swire & Sons and Jardines soon challenged its supremacy by launching competitive services. Dictionary of Hong Kong Biography, ed M Holdsworth & C Munn, HKU Press, 2012 This wonderful book collects in one volume more than 500 specially commissioned entries on men and women from Hong Kong history. This article was first posted on 21st November 2018.